The LCD on the watch features 170 LEDs to display rudimentary graphics which depict a smiley face, sleepy face, or the Autobots symbol. The watch also displays the time and various letters on the LCD. 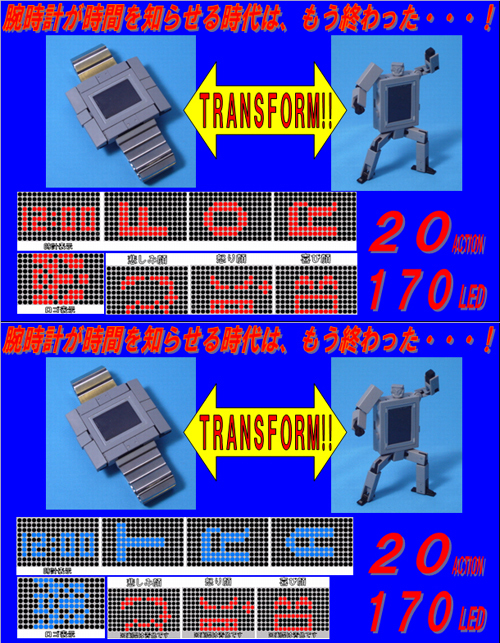 Two versions of the Chrono Label will be released later this year - a Cybertron Autoceptor version and a Destron Time Limit watch which displays the same dot graphics. Transformers Collection #15 features the Autobot known as Stepper which transforms from bulky bot to sleek Porsche 935 Turbo. The fire-engine red Inferno joins the rest of the Transformers that have already been re-released in a Transformers Collection re-issue from Takara. The Generation 1 toy assault continues with the release of Transformers Encore #5 and #6 a few days ago in Japan. If the final picture of the watch look good, I would buy it but I'm a TF freak. For now I rate it 3 stars. If you are willing to pay 290$ for this you need to see a doctor.